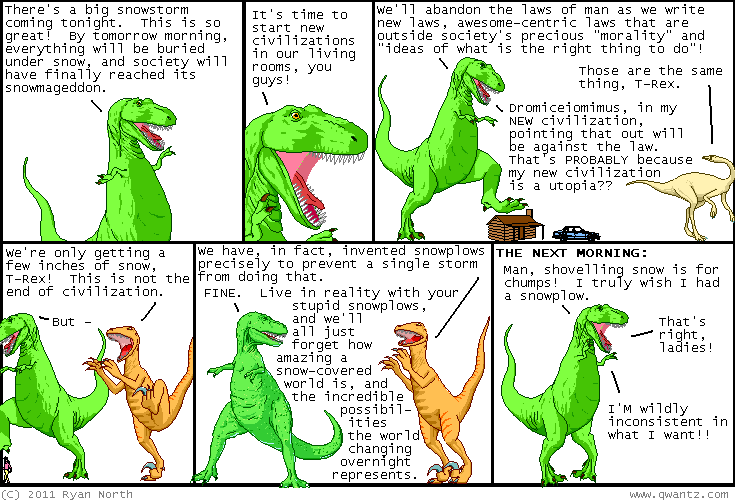 Dinosaur Comics - February 2nd, 2011 - awesome fun times! February 2nd, 2011: Remember the Canadian usage-based billing petition I linked to yesterday? The Prime Minister has ordered a review of the decision to make Canada's internet access extremely terrible, due March 1st, which is great. We've still got to keep pressure on till then, but this is a really good sign! If you're Canadian I'd encourage you to sign the petition. Yesterday I signed 160 books for people and I'm doing the same thing today! Popular clothing requests include top hat (NICE) and Batman costumes (NICE). T-Rex is a classy guy, especially when I draw him in those fancy duds! Unfortunately the signed book option is gone now as I have to go back to Canada tomorrow. One year ago today: anyone who argues the moon landings were faked is someone who is arguing that bags of poop aren't orbiting around us THIS VERY INSTANT. i ask you: do you REALLY want to be friends with such a person? ?